Our all-purpose "farm 105" in green! The fully insulated, stable plastic post from "VOSS.farming" provides top quality at a bargain price. An electric fence post must be stable and long-lasting: with "VOSS.farming" brand plastic posts you're always in safe hands. The electric fence posts are manufactured from high-quality polypropylene (PP), making them UV-resistant and extra resistant to breakage. Thanks to its colour, the post is ideally suited for use in open countryside. It blends perfectly into its surroundings, which means it's even permitted by nature reserve authorities. 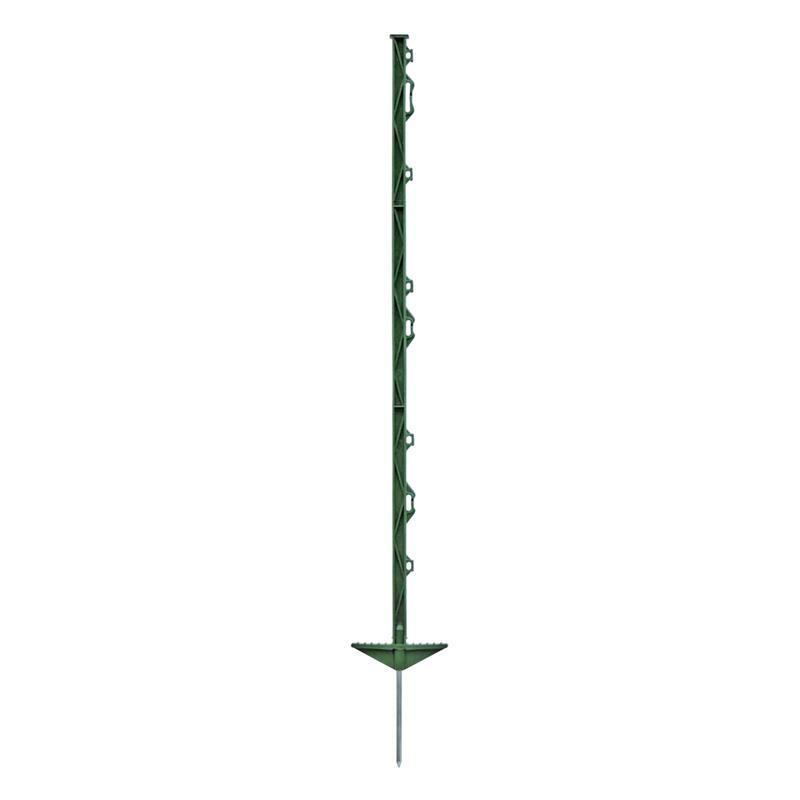 The VOSS.farming post is ideal for houses, courtyards and gardens. The practical, plastic electric fence posts can therefore be used for the most diverse purposes. For example, the posts can be used just as well to keep cows, sheep or domestic pigs as they can be used to protect against wild animals, such as wild boars. Thanks to its very appealing, discreet green colour, the post is also used in many domestic gardens as a poultry or dog fence, or fence for small animals. Thanks to their 19 cm-long stable steel spike and handy double-sided footplate the plastic electric fence posts are quick and easy to install. The electric fence posts provide you with 8 x polywire lugs, 5 x rope lugs up to Ø 6 mm, 3 x tape lugs up to 20 mm, and 1 x tape eyelet up to 40 mm. This makes the electric fence post impressively versatile. But the most persuasive feature of this fully insulated plastic post is itsoutstanding value for money! Thanks to its extra glass-fibre reinforcement, this fence post has high mechanical resilienceand a wide variety of applications. Take advantage of the electric fence post's high resistance to breakage as well, and protect your animals with professional equipment. Depending on the intended use, we recommended a distance of 3–7 m between posts. Shorter distances should be used for pet fencing in the garden than for large areas of pasture fencing. 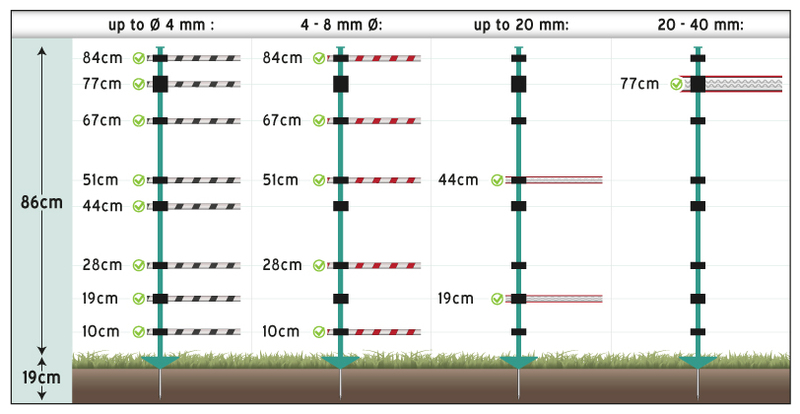 We recommend the mobile VOSS.farming "All-round post" for corners, starting points and long straight stretches (Item no. 44386).